In a post-apocalyptic world, driving through zombie-infested areas can be very dangerous, but duty is duty and you have been given this responsibility to collect supplies, rescue survivors, eliminate the walking dead and protect your bus. In Dead Ahead: Zombie Warfare, it’s all about teamwork and your survivor squad knows how to deal with the undead. You will come across various survivors – fast-moving melee, tank units, ranged units and many more deadly survivors who know how to tackle the zombie menace. 1. In every mission, your goal is to destroy the blockade and defend your van from zombies by deploying units. They will automatically attack any incoming zombie. You can also drop objects on zombies to crush them, throw Molotov to burn them alive (LOL) and send ranged, melee and tank units to make sure they don’t come close to your van. 2. You will need fuel to start a mission. It can also be used to explore a map. Fuel refills over time, but you can try and use the time-lapse cheat to refill them instantly. 3. Units need “Courage” points, which accumulate automatically. The blue bar at the top of the screen shows how much courage points you currently have. Each unit requires a certain number of courage points before it can be deployed to the battleground. However, every unit needs to “prepare” and the preparation time varies from one unit to another. Once a unit’s preparation time is complete, you can use courage points to deploy it. 4. You gain rage points after killing zombies. Rage points can be used to drop barrels and other objects such as Molotov on enemies. 5. Earn XP by completing missions and exploring areas. The XP fills the EXP meter at the top-left corner of the screen. When it’s full, you gain a new rank and unlock units. You also get a random item after ranking up. The unlocked unit can be hired using coins. Look for discounts on units and buy them if you have enough coins. 6. Getting 3 stars in a mission will allow you to earn bonus coins. Earning 3 stars in the first attempt will let you earn 50 extra coins. You will also get bonus coins for “First Victory”. But you will have to watch a video to get both bonuses. 7. Having a Tank/Melee/Ranged combo will help you overcome the zombie wave efficiently. Just make sure that the area isn’t overcrowded with zombies else “Fear” factor will come into effect and your frightened units won’t put up a good fight. 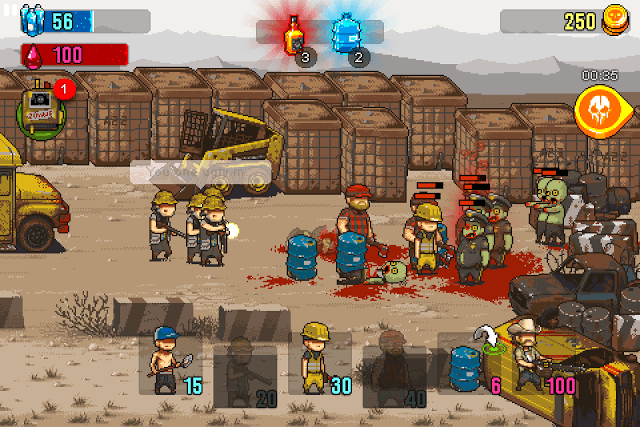 Use objects such as explosive barrels to destroy a group of zombies or use empty barrels to turn them into pulp. 8. When a new zombie arrives, the book of the undead appears on the upper left corner of the screen. Tap it to view details about the zombie. You might find some key info, strengths and weaknesses. 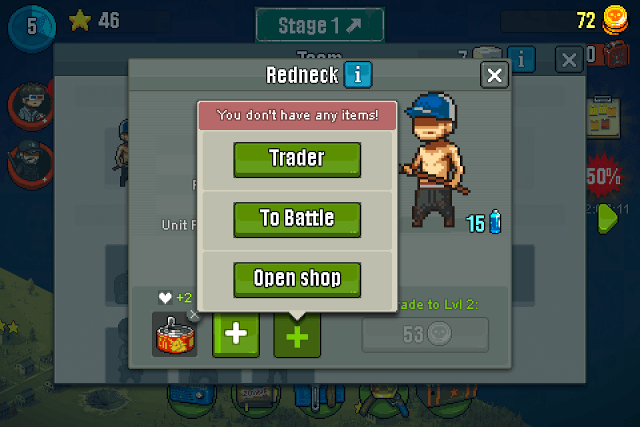 Melee units such as “Rednecks” require few courage points and the unit preparation time is only 3 seconds, so you can deploy them frequently, but make sure you wait for a few more seconds to send the Farmer. The farmer’s preparation time is 30 seconds, so you may have to wait for some more seconds while deploying melee units, but make sure you send at least two ranged units to back your melee units. They will shoot down incoming zombies from a distance while the melee units try to break the blockade or attack zombies. A ranged-melee combo ensures that the area isn’t crowded by too many zombies, making it easier for you to finish a mission. They Act as Obstacles: A barrel dropped on the ground can block an incoming zombie’s path. Common slow-walking brain-dead zombies will be busy breaking barrels if they are right in front of them. In the meantime, your units will take care of them. Can Destroy More Than One Zombie: Yes you read that right. However, you will have to wait for the right time before launching an attack. Drop a barrel when you spot a group of incoming zombies. Just make sure that two or more zombies are standing close to each other before dropping one. Barrels Can Kill Your Units Also: Look before you fling that empty barrel towards zombies. A low-HP unit can also be killed if a barrel drops on him. Try to avoid dropping barrels or other objects when there are too many friendly units fighting zombies as they can deal some serious damage to them. Don’t Forget to Upgrade Them: Upgrading barrels will increase their HP, Damage or the unit preparation time. Higher its HP, more time it will take for a zombie to destroy it completely. High damage would mean zombie HP will reduce considerably when it hits him. A low unit preparation time would mean that barrels will charge quickly so that you throw them at regular intervals. Save Coins for Explosive “Red” Barrels: Although they explode immediately after dropping on the ground, they can inflict AoE (Area of Effect) damage and can kill multiple zombies. A red barrel costs a one-time 480 coins and requires 9 rage points. You can get buffs from “Daily Rewards” (Third reward at the extreme right, laboratory icon). These buffs can help your units in one way or the courage. The blue liquid (aka generator) drops random courage bottles on the ground. Courage bottles keep appearing until the time limit of a generator is over. The orange liquid makes your units stronger for a few seconds. Use it when you face tougher zombies, especially fast-moving zombies. As you progress through missions, you will face far more dangerous zombies and your team won’t be able to kill them unless they are upgraded. Upgrading a unit boosts its health, attack, fortune (more on fortune later) and other attributes. To increase a unit’s stats, you will need to collect 3 items. You can get items from missions. On the world map, tap a mission and check the “Reward section”. Tap the “i” icon to see what the cache contains. (See screenshot). The number shown next to an item suggests what the chances of getting that item are. 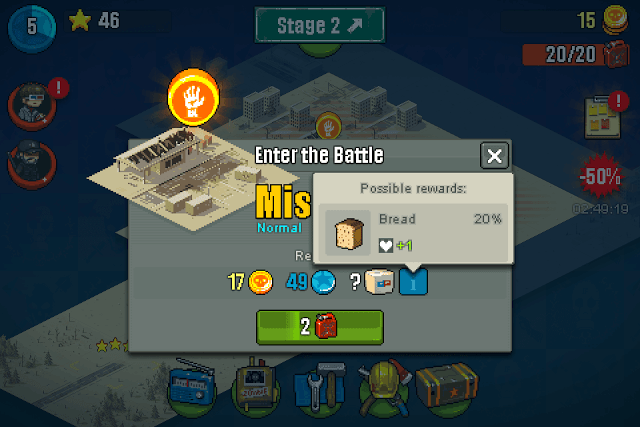 If it shows 20 percent, then there’s a 20 percent chance that you will earn that item in a mission. When a unit is ready for upgrade, a green arrow appears on the yellow helmet icon. Tap to enter your battle deck. You will see the same green icon beside a unit. Tap it and then press each green glowing button (there will be three button at the bottom) to put items on each empty slot. Now you may have two different items for the same slot. Choose the one that offers better stat boost. You can sell the unwanted item – the one that offers lower stats or use it for a different unit. 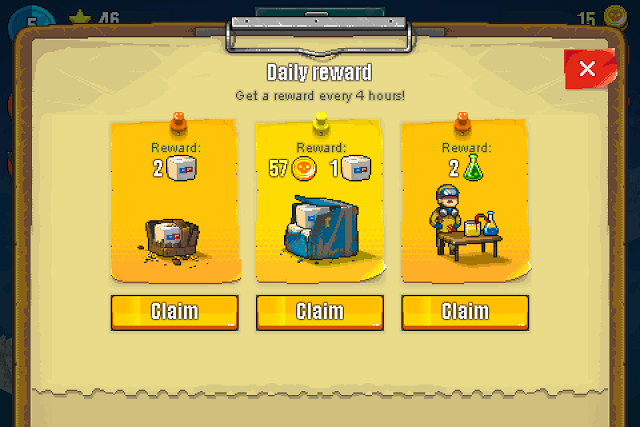 Check the Daily Rewards section by tapping the clipboard icon on the right side of the screen. The first reward gives you a guaranteed item. The middle reward offers coins and an item. You can get a reward every 4-5 hours. Sometimes rewards may take time and you may even have to wait 8 long hours before you can receive another one. You can, however, speedup time by watching a short 30 second video. You can find missing items easily on the battle deck page. On the world map, tap the worker helmet icon and then tap a team member. Next, tap the green button and press the “To Battle” button (see the above screenshot). The game will take you to a mission that provides the missing item. You can buy and sell items from the trade section. 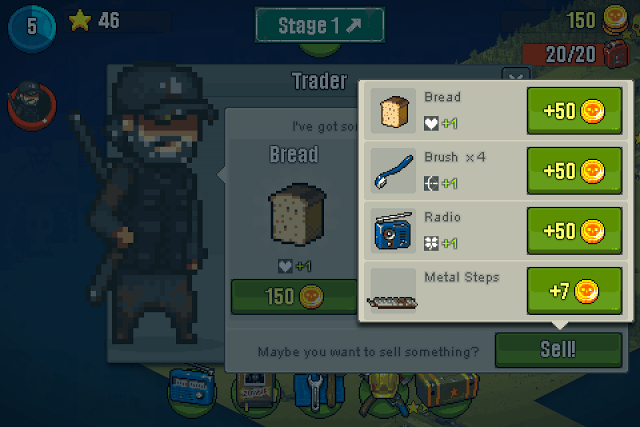 Just tap the black hat wearing trader on the left side of the screen and buy items that you need to upgrade a unit. The Buy screen will display 3 random items and new items will be displayed every 12 hours. You can purchase all or any one of them with coins. Select only those that you need for upgrading a hero. Before buying items go to your battle deck and press the blue button at the upper right corner of the “Team” screen just to ensure you are not buying something that you already have. At one point I had 5 toothbrushes and so I didn’t need more toothbrushes, so I purchased Radio for 150 coins it was missing from the set of three items that could upgrade one of my units. If you have too many items of the same type, you can trade a few of them for coins. Just tap the “Sell” button and the game will show a list of items you have collected so far and the amount you will get for selling one item. It’s game over if zombies tear down the big yellow van. Thankfully, the driver has mounted a machine gun, which can take care of incoming zombies. Your van can also take some damage before it gets destroyed by the undead. You will need to boost its Durability and Attack/Damage to ensure it does not easily get smashed by those green monsters. 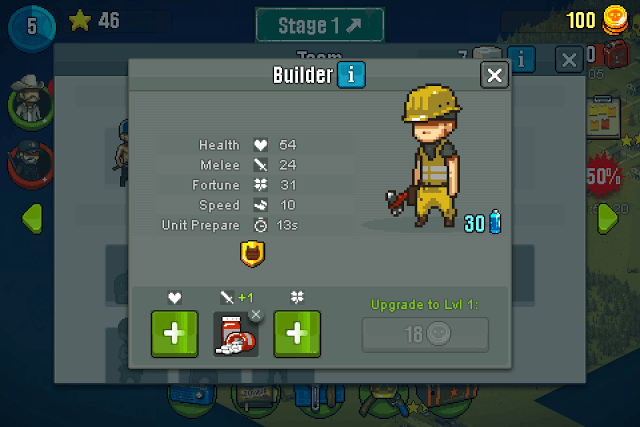 Tap the spanner/hammer icon on the bottom of the screen to upgrade your Bus. Use coins to upgrade your bus. Certain units such as the empty barrel will first require players to upgrade the van before you can upgrade them. You can equip your van with items that can boost its attack/defense stats. You can get items for your van from military cases. On the world map, look for cache icons (three boxes). 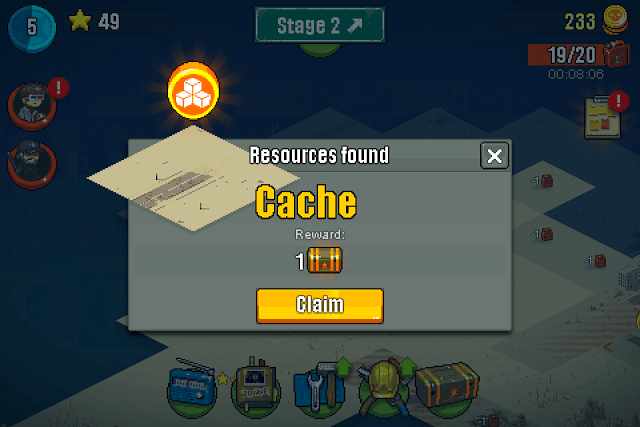 Tap a cache icon and you may get a military case. You will get items that will improve your unit’s “Fortune” attribute. But what’s the use of Fortune in Dead Ahead: Zombie Warfare? Well it increases the chances of deploying units that have a halo above them. Such units are more agile and can kill zombies faster than normal units. For example: If you keep improving a Redneck’s Fortune attribute, then the chances of deploying faster rednecks are more.